74% of existing coal plants cost more to operate last year than replacing them with new local wind and solar power, according to a report released on Monday from Vibrant Clean Energy and Energy Innovation. The analysis suggests most coal plants in the PJM region are uneconomic compared to nearby renewable resources. Coal resources receive revenue through the capacity market, which currently has rules that favor baseload generation and have "slowed the exit of uneconomic coal plants," according to Mike O'Boyle, one of the report's co-authors and an EI analyst. Nearly all coal plants in the Southeast have become "substantially at risk to replacement by solar in 2025," the report said. The report shows North Carolina, Florida, Georgia and Tennessee have the highest projections for coal plants being "substantially at risk" of replacement with cheaper nearby renewables by 2025. In the past five years, national and regional trends have shown coal plants as increasingly uncompetitive next to renewable resources. Last fall, Pacificorp released its own analysis deeming 60% of its coal units uneconomic. Other analyses, including reports from the Energy Information Administration, have shown renewable energy additions are even set to outpace natural gas. The EI and VCE report serves as another step in that trend, O'Boyle told Utility Dive, as a conversation starter about cheaper sources of energy. By 2025, the wind production tax credit will have phased out and the solar investment tax credit will have pared down to 10% permanently from today's 30%. In spite of that, the new analysis shows the low-case cost projections for solar and wind will outpace 86% of coal plants, according to the National Renewable Energy Laboratory. VCE and Energy Innovation designated plants as being substantially at risk when nearby renewable resources could replace the megawatt-hours generated by a coal plant annually with a 25% or higher reduction in cost. "By specifying the local resource, you're able to potentially reuse the grid infrastructure that the coal is already connected to to provide an easier path for that to be interconnected into the system without the uncertainty related to transmission," O'Boyle said. The areas that this analysis affect appear to be heavily skewed toward the Southeast and the PJM region. PJM's November report on power plant fuel dependency shows the grid is secure today, although risks could arise in five to six years due to unplanned retirements and additional stress on the grid. Based on the report, PJM supports more coal plants in their future projections for a variety of reasons, including the added capacity market revenues, which need "to be modified to be a bit more fair for renewables and other sort of new technologies to participate on equal footing with baseload generation," according to O'Boyle. "Part of the reason these coal plants are still alive, especially the most uneconomic ones, is because they're receiving quite a percentage of their total operating ... budget from capacity markets," he said. "What I just wanted to make clear was that PJM's market, including the capacity market, has to operate on a fuel neutral basis," Stu Bresler, senior vice president of PJM's Operations and Markets, told Utility Dive. He had not read the EI report, but said PJM evaluates resources on the basis of their offer and their relative contribution to reliability. Coal units have a higher capacity value on their nameplate stability than wind and solar. "Capacity values certainly are increasing" for solar and wind through technological advances, Bresler said. "As that continues to happen, that will naturally flow through the PJM markets, including the capacity market, and you will see the capability for more [renewables] to clear, but that's based on their actual, again, contributions to reliability." The cost crossover between stand-alone renewable resources and coal plants doesn't reflect a broader trend of renewables' competitiveness by eliminating data points that don't have existing projects within 35 miles. "For the west in particular, this research should not be seen as a claim that the western coal plants are somehow safe from the threat of cheap renewables," O'Boyle said. The states with renewable capacity in proximity of coal plants generally see coal capacity becoming substantially more at risk by 2025, except for Oklahoma and Kansas. Those states were "on the cusp" of having local renewables cost 25% less (or higher) than existing coal, but sunsetting tax credits moved them to a less risky category (0-25% cheaper). The slower the retirement of the uneconomic coal plants, "the more money they're leaving on the table for those customers in those regions," he said. *Cost measured on an annual generation basis. "I think owners of the baseload generators would argue that this analysis is not sufficient to sort of show their plants are uneconomic. they're absolutely right about that, but it kind of shifts the burden of proof," O'Boyle said. 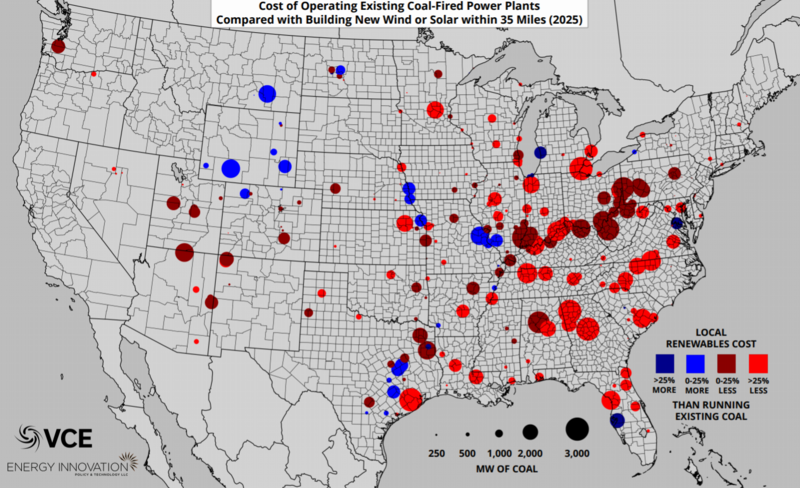 "We know that [coal plants are] more expensive to operate, so why are they still running?" Some utilities are already proving that the transition from coal generation is possible without increasing costs in their long-term planning. Northern Indiana Public Service Co. (NIPSCO) announced last fall in their integrated resource plan that building renewable energy will be cheaper than keeping coal plants open. The IRP proposes a portfolio of solar, storage and demand management to move from 65% coal generation to 15% by 2023 and none by 2028.